Film negatives became almost obsolete when digital cameras came into picture, when camera phones emerged, and when express image printing kiosks sprouted like mushrooms. Almost everything now is in digital format. So what are you going to do with your box of good old 35 mm film negatives? How will you preserve these precious memories? Make way for the Film to SD Scanner. With this converter, you do not have to go to the darkroom to view your photos. 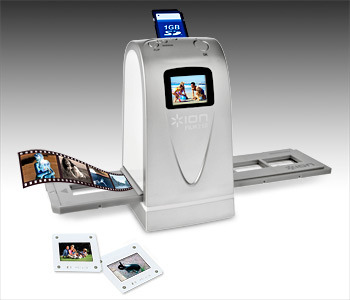 Just feed the pictures, scan, and then view the results in an instant. With a dimension of 15.2cm x 8.6cm x 8.3cm, the Film to SD Scanner will not consume much space. This portable and lightweight scanner is the best of its kind, with its auto-exposure and color balance, high resolution 5 MP negative film scanner for color and black and white film and slides, and integrated LCD color screen that allows you to view the results before saving them. This clever scanner includes a free 1GB memory card, which you can upgrade to 8GB worth of storage. It supports SD, micro SC, and SDHC memory cards. The Film to SD Scanner can be connected to your computer for additional storage, easy editing, and printing. It is compatible with both PC and Mac. You can also load the pictures onto the mobile phones and other portable gadgets for viewing. You can buy the Film to SD Scanner online at I Want One of Those for $165.16.